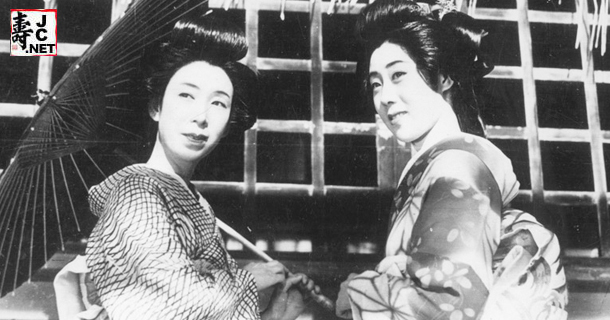 In Sisters of the Gion, director Kenji Mizoguchi follows the story of two geisha sisters as a way of portraying social change in urbanizing Japan. The sisters are opposites. Umekichi, the elder, faithfully observes established social roles. She believes that loyalty and obligation will lead to happiness. Her younger sister Omocha is rebellious, dismissive of her sister’s burdensome devotion to obligation, and angry at the men from whom she must try to wrest money. In clothing, language, movement, and behavior the two sisters are opposites. The fact that neither path leads to happiness, money, or success, and that there is no happy ending for their travails, is a clue that we are indeed watching Mizoguchi. Mizoguchi’s films often center on a woman (or women) in trouble. As geishas in the Gion district of Kyoto, Umekichi and Omocha have to find male patrons to support them to avoid being penniless. Neither is successful, and for most of the film we see each pursue their own strategy with unswerving diligence as they try to navigate relationships with men. The male characters are happy to use the women, but feel no responsibility to them. As the film progresses Omocha becomes the main focus of the story. Her efforts to manipulate and deceive potential patrons on her behalf and her sisters culminate in a scorned suitor taking revenge and throwing her out of a taxi. Umekichi rushes to her at the hospital, and, having learned nothing, in the final scene each repeats their naïve and failed strategy for finding happiness. 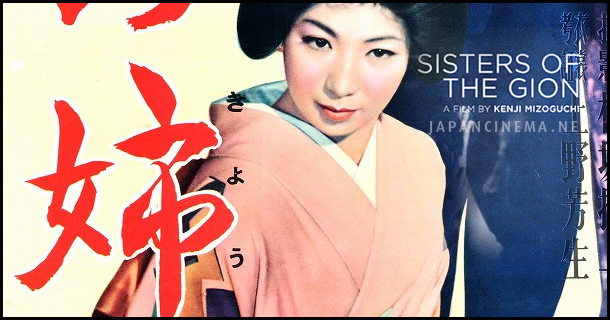 Sisters of the Gion is one of the best examples of how cinematography can echo and reinforce thematic content. Japan was rapidly changing in the 1930s. Increasing modernization, urbanization, and technological change presented a stark series of choices with the conservative order of the past. None of Mizoguchi’s characters have a stable social position. Men lose jobs and status as they too struggle to establish their careers and fortunes. Mizoguchi’s cinematography emphasizes this mobility and uncertainty. Interiors are shown to us through door frames and windows, and actors move in and out constantly. Stability is elusive. Throughout the film we are treated to an array of disorienting shots and unexpected angles. Edges predominate – roof eaves, walls, curtains, and doorframes cut across the screen and partially obscure characters. Long vanishing shots emphasize social distance and separation. The recurring focus on an alley outside the sister’s home likewise underscores the fleeting, the in-between, and the temporary quality of life in the Gion. “Men are our enemies. I despise them!” So Omocha declares at the beginning of the film. She sees life as a gender battle against a male-dominated world. Thankfully, Mizoguchi’s film is not content with such a simple message. Women have few options, but Japanese men too are at the mercy of a ruthless economy. Bankruptcy, fake goods, low wages, and theft are all facts of life. No character finds resolution or success. Sisters of the Gion is a beautifully and creatively filmed look at a world undergoing rapid change with no clear prediction for how it will turn out. Recommended. Posted on September 13, 2013 by bilcummings. Bookmark the permalink.